Harold Sweet, of Samy's Camera Rental in Los Angeles, tells me that the Tiltall handles live in the center column during travel - easy with today's TEP6 base (A, right). Also works with the Leitz and Machioni "ring". Then, just like they tell you on the aeroplane- "put your head between your legs" (B, right) and you will be a more successful Tiltall traveller. Now we enter the realm of wishful thinking - my lightly altered travel Tiltall (C, right) has three removable legs, actually three Tiltall four section Monopods. This custom version is the same overall height extension as the standard Tiltall. 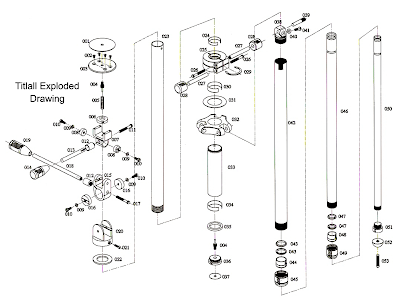 See the parts disassembled in the final frame (D). Note the formerly traditional Tiltall tripod head is now removable and tiny, only one pivot, not two - and three handles, not four. What's so important as to shave off five inches (20 cm) from the length of a tripod? At 21 inches, you can carry the Tiltall onboard the airplane under the 9x14x22 inch dimensioning rules for carry-on baggage. 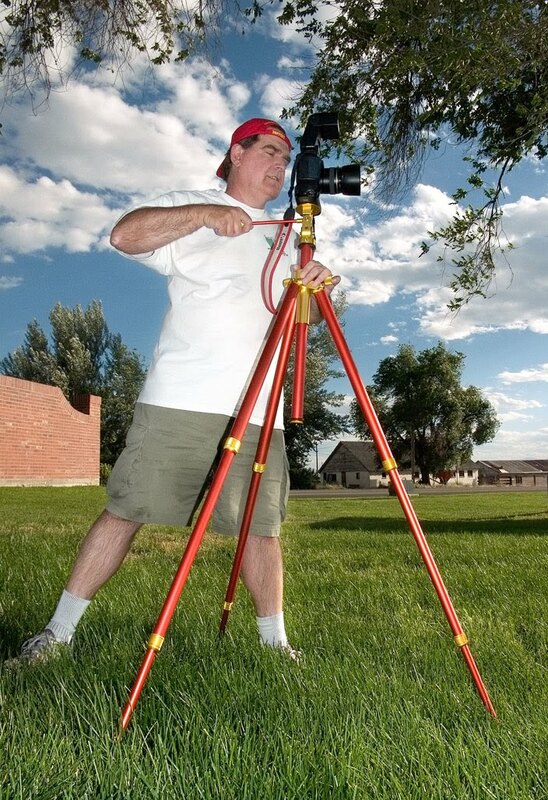 Does this tripod exist? No and maybe - how many do you want? Tony- Let's try a repair/cleaning - first open up a working leg to get a "lay of the land" - with the original Marchioni and the Leitz, there will be coated brass fittings (ie bushings) - you may either have some grit in the jammed leg or your coating on the brass has worn off and starting to jam. 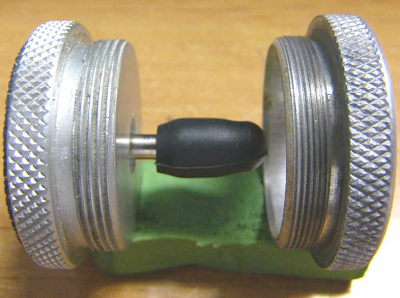 The current solution is a nylon bushing which does not fit the earliest Tiltalls very well. You will probably find that if you reverse the brass bushing, add a little lube or exchange it with a different leg that you will get another 30 years out of the tripod. Alternatively, watch for a good deal on EBay for a Tiltall of the same age and manufacturer and merge the two into one working tripod. Now I do have a half dozen rebuilt KingHome Tiltalls available, but better to revive your classic. Pictured is a double length column (see headless column for monoballs) for use with spotting scopes and binoculars - or more exactly - an ardent bird watcher requested this extra long column for just such use. Why? Any of you birders let me know. Malcolm Denemark, chief photog of Florida Today has re-invented the Marchioni cork top pads - I encourage you to contact Malcolm directly. Here are Malcolm's installation instructions. 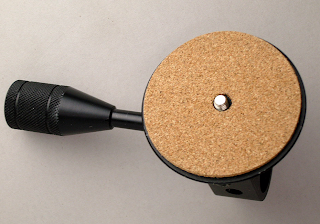 "Enclosed is a natural cork replacement pad for your Tiltall tripod. The Tiltall tripod is one of the best tripods ever manufactured. With care, it should last a lifetime. The one Achille’s heel of the Tiltall tripod is the platform pad. Time, heat, cold and years in hot car trunk can make the original rubber pad curl and come unglued. "To remove the old pad: Peel off the pad. If there is glue residue on the platform top, clean it off with a scraper, a dab of Goo-Off or mineral spirits. "To install the new pad: The Easy Way- use contact cement on the platform top and the cork. This will stick well, the only negative aspect to this method is that you cannot slide the pad around to position it correctly. The two parts will stick immediately. There is no adjusting the cork top. Be sure to face the curl down if you use this method and center the pad when you put it on the platform, starting with the hole centered on the screw and work outward. "The Better Way: I have had the best luck with Gorilla Glue, and using a small piece of wood to clamp it with. I cut a small thin piece of wood at least 3 inches square and drill a ¼ inch hole in the center of the wood for the camera screw. The block of wood should be big enough to completely cover the metal tripod platform. I used a 1” x 4” making a 3 ½ inch square. (Do not drill a hole too much larger that the screw or you will get a bubble in the cork from not being clamped). Have clamps ready to go. "Put a thin coat of Gorilla Glue on the metal tripod head. Spread it evenly, but do not get in on the center screw or the outer edge. Gorilla Glue expands. DO NOT use too much, and do not fill in the four holes for the set screws in the tripod head with glue. The excess glue will expand and put four lumps in your tripod pad! I take a paper towel and wipe any glue off the metal platform near the very edge. Position the cork pad. The pad has a natural curl to it. Place the cork with the curl down, so the center is up, the edges curl down. This will mean the cork is not fighting to curl up at the edges after it is glued. "IMPORTANT! Wet the bottom side of the cork with water. The bottom is going to mate with the metal platform . The water activates the Gorilla Glue. This is how Gorilla Glue works. If you do not wet the cork, it will not work. "Center the cork pad onto the platform. Be sure the hole is centered on the camera mounting screw. With Gorilla Glue you can slide it around to position the pad. "Place the wood on top of the cork and clamp for an hour. After an hour check to be sure no excess glue oozed out and glued the wood block to the platform. Check to be sure your ¼ inch camera mount screw still spins and recesses. Reclamp for 24 hours. "When dry I use a light spray of ArmorAll or similar product (an automotive product for dashboards and vinyl) to keep the cork moist. You can do this occasionally to keep the cork from drying out. "Do not use Elmer’s Glue or white craft clue. Those glues work well on porous objects, not metal. Goo-off, Gorilla Glue, Elmer’s Glue and ArmorAll Protectant are all registered trade mark brand names." 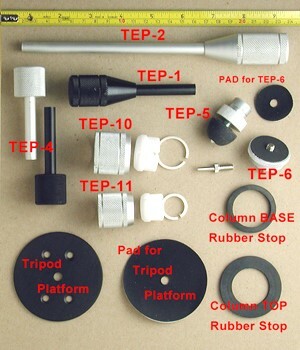 Note that present day Tiltall TEP6 base with 1/4-20 tripod screw (left) is a newer idea and different thread count than the original Marchioni column base termination. The addition of the tripod screw seems to have happened either with the later Uniphot version or with the Omicron folks. The idea no doubt occured with photographers using a Leitz, StarD or Uniphot Tiltall and adding a 1/4-20 bolt in the center of the solid end cap at the bottom of the column. (Marchioni has/had a "donut" end stop with a hollow center). 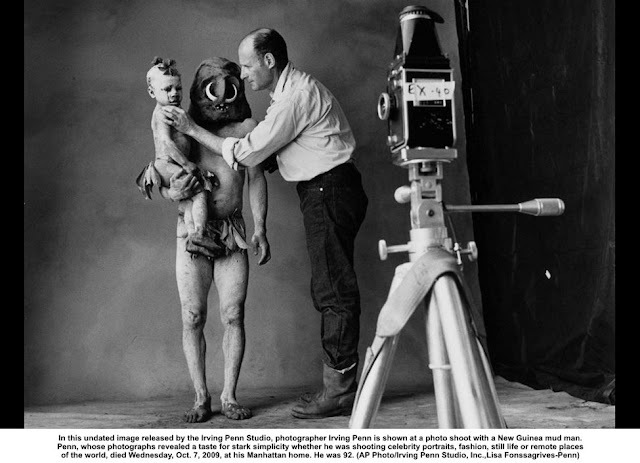 Thanks to Brian Wolfe, of Classic Cameras, Tehachapi, California for photo comparison. If you own a Marchioni Tiltall with a 1/4-20 termination (ie present TEP-6), let me know. The mythical belief is that the advent of the removable leg came at the same time as the 1/4-20 tripod threaded column base. Ed. note - see later post as this is not true - removable leg came long before TEP6 monopod idea - why?